Have mobile payments lived up to the hype? How can retailers compete with Amazon? Are customer engagement strategies measuring up? 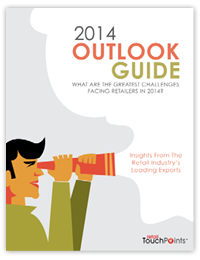 These and other questions are asked and answered in the Retail TouchPoints 2014 Outlook Guide. A total of 15 retail industry experts — including well-known analysts, consultants and researchers, and two retailers — have shared their expertise and predictions for 2014 and beyond. This year, we asked some of last year’s contributors to reflect on their 2013 predictions before commenting on 2014. You’ll be surprised at their candor and comments related to past, present and future insights. Some key topics for 2014 include: Personalization, Social Evolution, Omnichannel Imperatives and the importance of Analytics. Our experts have contributed tips for executives in all types of retail segments, from specialty and big box to grocery and home improvement. To access a complimentary pdf of the complete Guide, complete the form below.